DC Comics’ Crisis on Infinite Earths struck terror in the hearts of comics fans everywhere in the 1985. 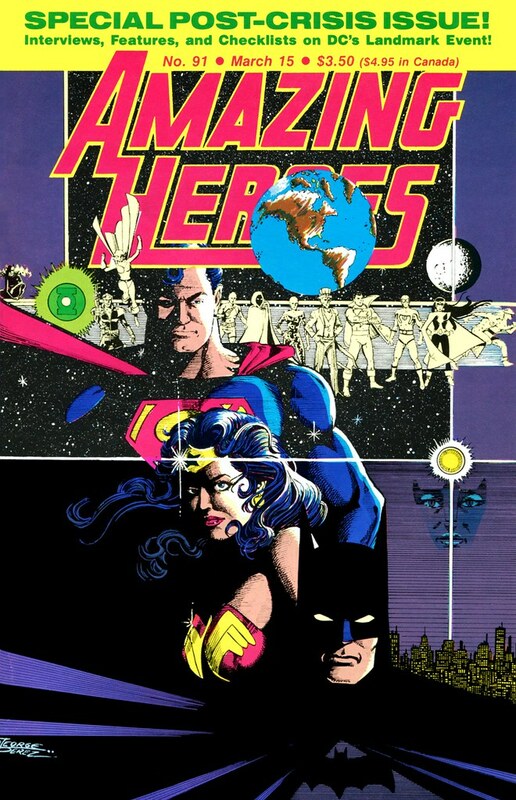 Amazing Heroes magazine was there to provide behind the scenes articles, with some terrific covers by George Perez. 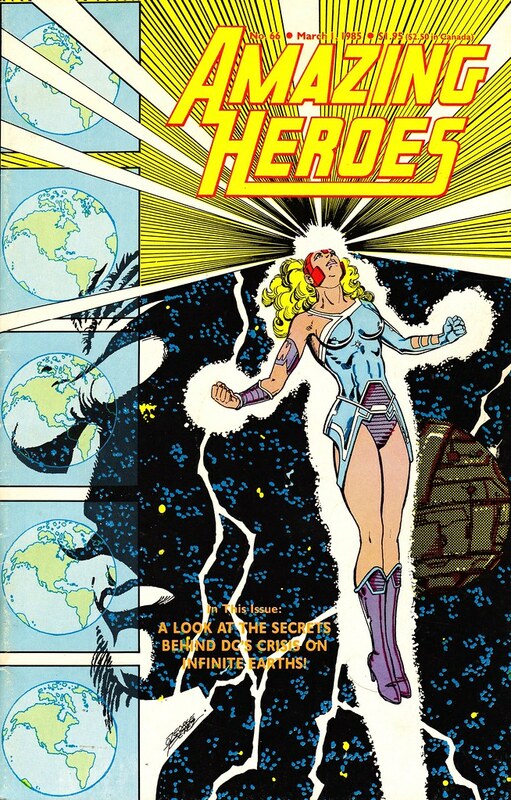 Amazing Heroes #66 from March 1985 provided a look at Harbinger and her mentor, The Monitor. Framed by five parallel worlds, it was an intriguing look at the two characters who knew the most of the forthcoming Crisis. The Monitor had been floating around making tiny appearances in various titles even before the Crisis mini-series started. Would you believe that the article in AH #66 was written by Mark Waid? Waid was the perfect person to interview the creative team, given his encyclopedic knowledge of the DCU. A decade later, Waid would help create his own apocryphal tale (along with Alex Ross), Kingdom Come. On the flip side, March 1986, there was a special wrap-up issue featuring this gem of a cover by Perez. 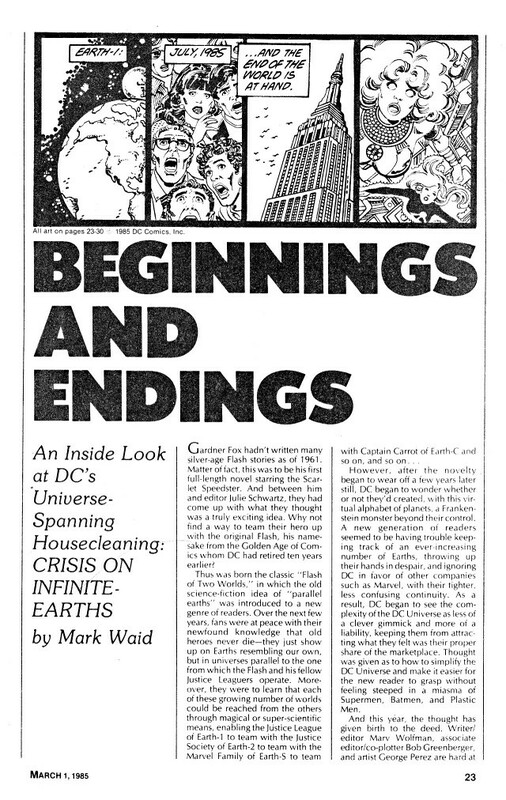 Mark Waid (a Special Guest Editor for this issue) provided a lot of articles here: a DC Comics obitiuary of all the heroes who died, Who’s Who in the New DC Universe, etc. Roy Thomas also got interviewed by Andy Mangels—the Crisis essentially gutted everything related to Earth 2, All Star Squadron, and Infinity, Inc. The shocking news that All Star Squadron would end with issue #60 was heart-breaking. Amazing Heroes #91 was chock full of Crisis goodies. You can tell that Andy Mangels and Mark Waid must have worked very hard compiling all this information. 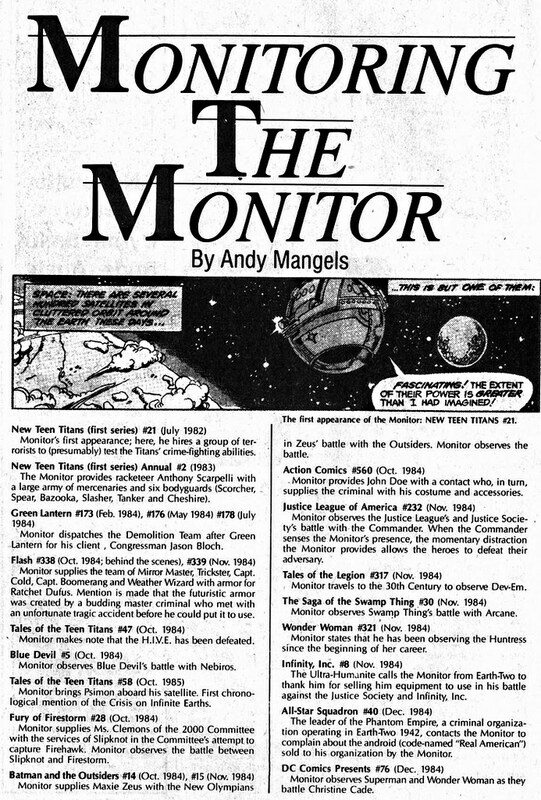 Mangels also wrote an article titled Monitoring the Monitor, a checklist of all the hidden easter eggs scattered across various comics. His first appearance was nearly three years before the mini-series, in New Teen Titans #21 from 1982. Nuff Said!